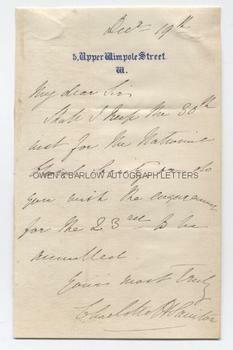 CHARLOTTE SAINTON-DOLBY autograph letter Signed. ALS. 1p. 5 Upper Wimpole Street, W. December 19th [no year]. To "My Dear Sir". "Shall I keep the 30th inst for the National Choral Society or do you wish the engagement for the 23rd to be . . . [?]". 12mo. Approx 5.5 x 3.5 inches. Mounting traces to top corners of blank verso, else fine. Charlotte Sainton-Dolby studied under Crivelli at the Royal Academy of Music and made her Royal Philharmonic Society debut in 1841. She was a favourite singer of Mendelssohn and the contralto part in his Elijah was written for her voice. She was the principal soloist in the first English performance of Bach's St. Matthew Passion in 1854. Born Charlotte Helen Dolby, she married the violinist Prosper Sainton in 1860 and retired from public performances in 1870. She founded her own singing academy and also had moderate success as a composer. Charlotte Sainton-Dolby was one of the most highly regarded contralto singers of her generation and a Royal Academy scholarship was named in her honour.